The first one reported that the images and videos projected many times during the trial were extracted by him from the devices confiscated to the accused. His deposition was short and very technical, focusing mainly on the modality of data extraction. The second agent instead took part to the investigations previous to the arrest of the accused, as well as to the following analysis of the confiscated material and the information released by the accused during the interrogatories. He gave a clear and detailed description of what emerged during the investigations and confirmed the position of the accused upon the Karachun hill, the type of weapon owned by the GNU and the corresponding range / pull length: all of this matched with the depositions so far, as well as the reconstruction of events done by the Pavia public prosecutor’s office and the one given by the journalist William Roguelon, who survived to the attack. Two Senators of the Ukrainian Government were summoned to testify. 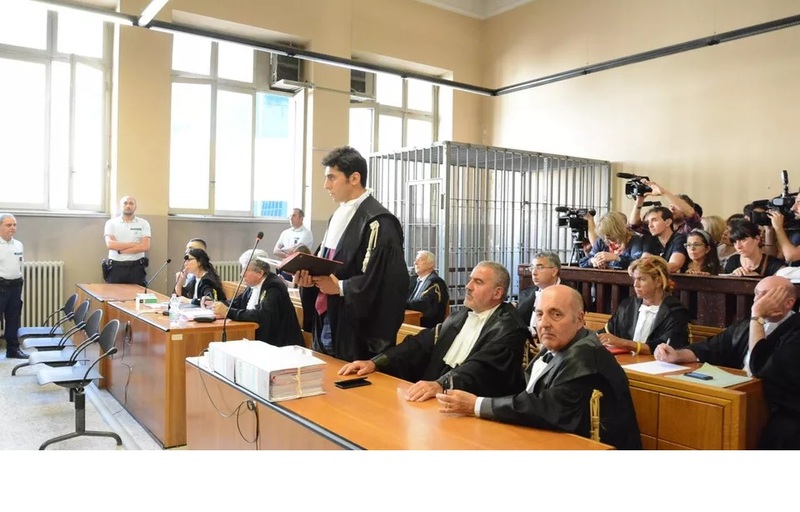 After Vitaly Markiv was arrested in August 2017, both of them voluntarily presented themselves to the public prosecutor’s office of Pavia as the maximum experts of the event. Their deposition had been received and recorded by the Special Operation Squad in Milan: the two senators had given two contrasting versions of the events. During the hearing, their versions has been analyzed again in front of the Court. Both conversations have been extremely disagreeable due to the sense of reticence, weakening of the truth and significant will of not telling the truth to the Court, from the witnesses. Moreover there were many difficulties with the translation. Underlines the difference among the role of the Ukrainian National Guard and the role of the Army: the first one is a reserve military unit subject to the Government, that was disbanded in 2000 and then funded again in March 2014. The controversial Azov e Donbass battalion are a part of the GNU and they are mostly made by Ukrainian, European and even Italian volunteers. The accused was part of the GNU. The Army is the legitimate army, subject to the Ministry of Defense and lead by the general Zabrowski. The senator also confirms that the Army used to have mortars as part of their equipment. The witness and the jury are shown a sketch made by the witness himself representing the peak of the Karachun hill and the positions of the military equipment and the accused. The sketch is confirmed and compared with the video selfie mentioned above, as well as with the different declarations granted during the conversations taken place in August. Recognizes almost all the names of the soldiers listed by the public prosecutor Zanoncelli. Even though he was on that hill on the 24th May 2014, the senator asserts that he only got to know around mid June or even July about the killing of Andy and Andrej. He got to know about the events at least one month after the attack. He had never been on the Karachun hill before mid-June. No written orders for attained. Recognizes some names of the other soldiers listed by the public prosecutor. Lieutenant Benedetto Vinciguerra: major Italian expert of ballistic and curved shot artillery; he teaches at the military academy in Rome, infantry unit. He recognized and explained the functioning and origin of the weapons/devices appearing in the photographic material confiscated to the accused, including the video taken on the Karachun hill – from where the shooting came – in which the accused frame himself. During the hearing, the Lieutenant Vinciguerra was shown the images of the screened by shoots and the testimony recognized that the holes on the car body were caused by mortar splinters and machine guns. The Lieutenant informed about the maximum distance each of the listed arms can get to: each of them would have been capable of covering the distance from the hill to the spot where Andy and Andrej were shot. Finally, the expert explained the need of an observer: who gives the target coordinates to the shooter, positioned with the mortar in a spot not much visible. Chief of Police Napolitano: chief of prison police in Pavia; reported about the accused staying in the Pavia prison; the accused has been moved to the Opera prison for security reasons following proven evidences of an escape plan including attack to police agents. Luca Trabalza: assistant of the Italian embassy in Kiev at the time of the investigations. He testified about the difficulties of setting a verbal contact with the Ukrainian public prosecutor’s office and receiving any type of feedback regarding the investigations carried in Slaviansk. Lieutenant Russo: RIS in Parma; carried the chemical analysis on the materials found on Andy’s backpack, that detected the presence of trinitrotoluene traces and rdx, normally contained in mortar shoots and hollow charges. Ballardini: coroner who carried out the second autopsy on Andy’s body at the San Matteo Hospital in Pavia. He confirmed what roughly reported in the medical report of the autopsy carried out in Ukraine. He also testified of not having ever received from Ukraine the evidences extracted from Andy’s body, the splinters.